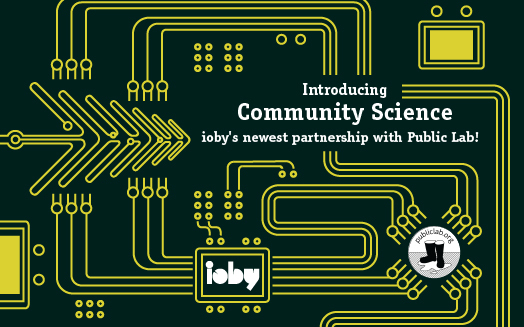 We are very proud to announce ioby’s newest partnership with the Public Laboratory for Open Technology and Science. Community groups in Boston, New Orleans and Brooklyn use Public’s Lab’s innovative, open source DIY tools to monitor environmental issues. Whether tracking chemical emissions from refineries, teaching kids about civic responsibility via kite mapping, or monitoring progress on efforts to remove invasive species, Public Lab contributors work to create healthier, more engaged communities using fun, simple techniques. Using everyday items–like handheld digital cameras, kites and string–Public Lab members re-imagine environmental monitoring tools, taking science out of its ivory tower and making it an accessible part of everyday life. With Public Lab, people leverage the brain power and experience of thousands of contributors around the world to create results in their own backyards. New Orleans, LA — The Public Laboratory for Open Technology and Science today announced a partnership with crowdfunding non-profit IOBY to host a series of locally focused environmentally themed crowdfunding campaigns. The five projects span several Public Lab regions from Massachusetts to Louisiana, and range from educational initiatives to pollution monitoring projects. Local level, site-specific projects are the core of Public Lab’s collaborative community, many members of which come together around specific environmental threats such as landfills, chemical spills, or polluted urban waterways. This innovative partnership structure between the two non-profits organizations heralds further, fruitful collaborations. These projects provide a window into some of the most vibrant independent place-based research in the Public Lab network, revealing environmental issues of high priority to local residents — issues which government or industry have often overlooked. The Public Laboratory for Open Technology and Science (Public Lab) is a community — supported by a 501(c)3 non-profit — which develops and applies open-source tools to environmental exploration and investigation. By democratizing inexpensive and accessible Do-It-Yourself techniques, Public Lab creates a collaborative network of practitioners who actively re-imagine the human relationship with the environment. The core Public Lab program is focused on “civic science” in which we research open source hardware and software tools and methods to generate knowledge and share data about community environmental health. Our goal is to increase the ability of underserved communities to identify, redress, remediate, and create awareness and accountability around environmental concerns. Public Lab achieves this by providing online and offline training, education and support, and by focusing on locally-relevant outcomes that emphasize human capacity and understanding. Since its founding during the 2010 BP oil disaster, Public Lab has launched a series of community-driven environmental technology projects, using a collaborative open source development process to rapidly innovate affordable tools to respond to and understand environmental threats. ioby is a crowd-resourcing platform for citizen-led neighborhood projects. Our name is derived from the opposite of NIMBY. We have a mission to deepen civic engagement in cities by connecting individuals directly to community-led, neighbor-funded environmental projects in their neighborhoods. ioby connects change with resources. It enables all of us to invest in change—then see (and live with) the return on our investment. There are everyday neighbors taking small steps—bringing strength, open space, fresh food and greenery into our backyards.